In Internet time, 10 years is an eternity. Social networking platforms rise and fall, popular personalities are forged and forgotten, and the ways in which we consume, share, and discuss media are wont to change with startling rapidity. 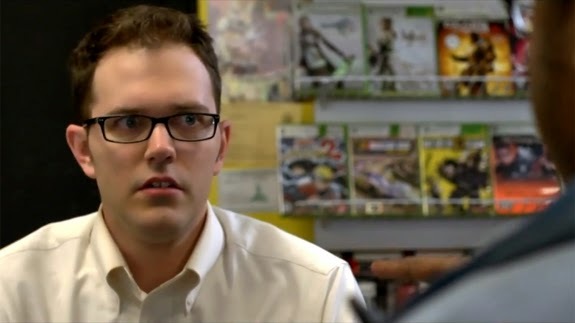 That James Rolfe’s Angry Video Game Nerd character has now survived an entire decade online, maintaining a passionate fanbase and a measure of online cultural currency over 119 episodes and an increasingly erratic release schedule, is just one of the many amazing things about this vitriolic gaming review sensation. The series, which has from its inception displayed a palpable intelligence and fierce creative passion to complement Rolfe’s delightfully silly and scatological comic stylings, always stood out from the pack of web review shows, and even as the type of entertainment the show provided evolved over time – AVGN eventually settled into a calmer, more educational rhythm, something that’s given the show greater longevity beyond its initial, rancorous premise – the amount of enjoyment it has to offer has not, in 10 years, diminished in the slightest. With Angry Video Game Nerd: The Movie, that enjoyment is at a fever pitch, and the series’ unlikely lifespan seems more miraculous and unique than ever before. Rolfe and co-writer/co-director Kevin Finn have crafted a full-length feature adventure that both honors the series’ game review foundations and transcends them utterly, a film that plays beautifully to the fans through its wit, charm, and personality, rather than just pandering or repeating itself. Rolfe and Finn have aimed big here, and while the end result is undoubtedly a micro-budget, occasionally haphazard production, there is so much passionate creativity on display, such enthusiasm and spontaneity and lust for the pleasures and possibilities of filmmaking, that it is impossible to leave the theatre with anything less than a broad, warm smile and a renewed appreciation for the role of imagination in cinema. The film – which is in the middle of a limited, largely sold-out independent theatrical run, and will hit VOD services on September 2nd – follows Rolfe’s Nerd character beyond the confines of his gaming room, and the film immediately does a nice job establishing an alternate, skewed version of our own reality, where the Nerd is a real person, not a character, and his popularity has led to fans rabidly revisiting the awful games he routinely picks apart. As in real life, the fans’ most requested review is E.T. for the Atari 2600, the game so infamously bad that it not only helped sink the entire gaming industry in the eighties, but which was allegedly recalled and buried in droves in the New Mexico desert. The game scarred the Nerd so badly as a child that it’s the one cartridge he now refuses to touch, but upon realizing that ignoring the game may only allow its infamy to grow, he reluctantly sets out upon an expedition to uncover the E.T. landfill, prove the stories are a myth, and save the fans from ever having to suffer the torment of experiencing gaming’s darkest hour. The story spins rather wildly out of control from there, of course, and while the film is downright deliriously silly in the complicated web of conspiracy, science-fiction, and lunatic mythology it weaves, every inch of the narrative feels like an organic extension of Rolfe’s online voice. This is a completely natural evolution of the Nerd character himself, who, in the show, always seems compelled to continue reviewing terrible games simply because he is too stubborn not to. He’s just wired that way, and while that works wonderfully as a joke in the series, it becomes a real defining character trait here, as the Nerd’s every decision is predicated by his own stubborn refusal to leave the job unfinished, and he becomes increasingly, hilariously committed to completing an adventure he had very little interest in starting. Similarly, the film itself stems very clearly from Rolfe’s love of B-movies, horror, monsters, and camp, an amalgamation of tones he and Finn have pretty well nailed. The movie is filled to the brim with practical effects that range from effectively campy to intentionally terrible, and one of the film’s greatest pleasures is that every budgetary limitation – every cardboard robot, toy vehicle, and obvious green-screen composite – ultimately feels like a boon, something that fleshes out the tone and voice of the piece, and which offers an additional, invited laugh at every turn. Voice, indeed, is what matters most here, for while there are plenty of technical shortcomings to the film if one chooses to focus on them, Rolfe and Finn’s artistic passion shines through from start to finish, and as much as any movie I have seen this year, this is a film imbued with unique, inimitable creative identity. In a commercial landscape, that’s something most movies simply don’t have, blandness and anonymity often coming part and parcel with money and resources. Angry Video Game Nerd clearly wasn’t made with a lot of money, and the production often feels like it’s holding itself together with duct-tape and spit (particularly where the sound design is concerned), but the energy is absolutely undeniable, and the entire film feels like an exuberant ode to the art of cinematic creation, an opportunity to craft something fun and express one’s voice exploited in full. I don’t think I can properly express in words what absolute joy that kind of passion instills in the viewer, especially when the film is so extraordinarily, astonishingly funny from start to finish. Every joke, one-liner, sight gag, or reference lands perfectly, and while Rolfe and Finn rely on a few classic AVGN jokes early on to help establish the character and the tone, the film quickly proves itself to be bursting with originality, and the go-for-broke imagination prompts laughter more or less constantly. The comedic hit ratio here is just absurdly high, and when seen with a large, enthusiastic crowd of fans, every person in the theatre in on every joke, the experience is simply remarkable. Those seeing the movie for the first time in its digital release next month will undoubtedly enjoy it, but I also fear they will be missing out on something, because the in-theatre communal experience the film fosters is downright magical. When watched alongside so many other fans, there is a palpable warmth and joy in the room to go along with all the non-stop, raucous laughter. It is a sensation the film invites on so many levels, having been made for the fans, with the direct interaction of fans, and with a story that is, at its core, about fandom and community. And just as the Nerd comes to learn exactly what his fans mean to him over the course of the narrative, the film’s existence and the experience of watching it feels like proof positive of the power and joy of fandom – a film and a group of people coming together to create a communal experience that feels like so much more than a mere summation of parts. The final scene in particular is downright perfect, in every way imaginable, and there is a legitimately touching warmth to the closing moments that sums up what the Angry Video Game Nerd – both character and online sensation – is about so incredibly well that were Rolfe to retire the character here, it would feel exactly right, even as the film proves there is plenty of comedic life left in him. Rolfe and Finn have assembled a very solid cast here, even as the biggest failing of their script is the difficulty they have consistently finding things for the supporting players to do. Jeremy Suarez plays Cooper, the Nerd’s fictional best friend and self-appointed manager, while Sarah Glendening plays Mandi, a corporate marketing upstart who wants to use the Nerd’s fame and influence to drive sales of a new, terrible game. Both play tremendously well opposite the Nerd, and Glendening in particular has a glowing screen presence and strong comedic voice, but both eventually get lost in the narrative shuffle, Glendening earlier than Suarez, and I think the script could have used just a tad more polish in the second and third acts to make sure these characters had more of a presence and pay-off. Stephen Mendel, meanwhile, makes for a terrific villain, hilarious, hammy, profane, and tuned 100% into Rolfe and Finn’s particular deranged wavelength, and all the cameos – of which there are many, culled from prominent Internet personalities and beloved AVGN guest stars – are effectively funny and expertly placed. Yet it is Rolfe himself who actually makes the biggest impression, proving here that the Nerd is a real character, not only one he can hang an entire movie on, but who is several magnitudes funnier and more compelling 10 years later than he was back in 2004. Rolfe is so good at playing this part by now, his signature array of hilariously befuddled facial expressions more effective than ever before, and he does such a good job of expanding the character here, making the Nerd feel like an organic centerpiece to this wild and zany universe, not to mention an off-beat hero worth rooting for. 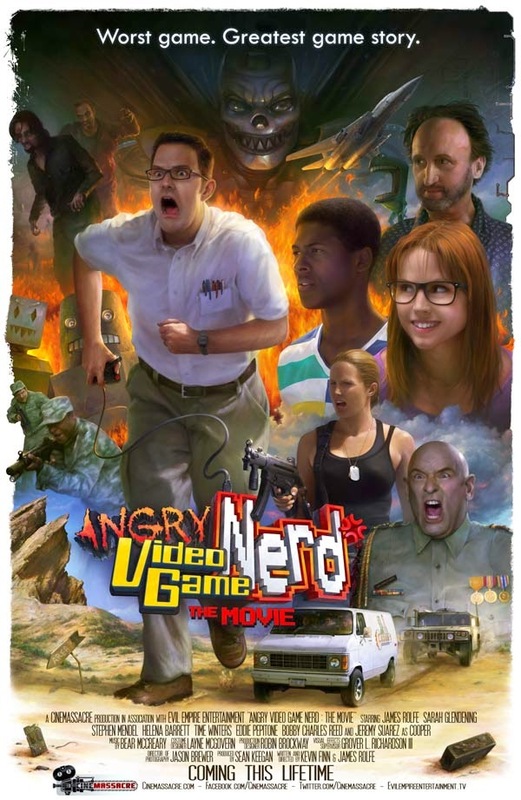 Is Angry Video Game Nerd: The Movie a film non-fans can enjoy? I’m not sure. Probably not, though the character is so sharply written here, and the creative energy is so palpable from start to finish, that I think even a newcomer could find things to admire. Ultimately, though, this didn’t need to be a movie to attract newcomers. This was a film made on Rolfe’s own terms, spurred by a decade of fandom and created as a veritable love letter to the people who made the web series successful, and for those of us who have been along for the entire 10-year ride, the movie is more than just funny. It is positively magical, and left me feeling downright inspired, motivated and enthused by the sheer force and passion of creativity on display.